J.T. Spencer is a finer purveyor of embroidered belts and other accessories from Richmond, Virginia. This business is well known for their quality and craftsmanship. I asked to have them in my Holiday Gift Guide because of this. They began with a dream of manufacturing high quality custom logo belts here in the United States that could be sold at high end golf and country clubs. The Original Embroidered Belt hit the market and quickly began to gain momentum with pro shops all across the country. After establishing a strong foothold in the golf market J.T. Spencer forged a partnership with Peter Millar who made the company an official licensee of their brand and greatly expanded their customer base in the golf business domestically and abroad. In the many years that have passed since the beginning of the business, J.T. Spencer has expanded into a myriad of other industries. Their custom business has grown to include yacht and athletic clubs, schools, companies and a variety of other affinity groups that want to show pride in their organization. Their items can be found at some of the finest universities and colleges all across America. With designs that cover everything from the time-honored American Flag to the quirky Beer Pong they make every effort to offer motifs on timeless and classically styled products that appeal to everyone. I have two gifts today that I want to share with you. The first gift is an old fashioned flask. The second is an embroidered key fob. This is a 6 oz. stainless steel flask with waxed canvas and full grain leather wrap permanently fixed around the flask. 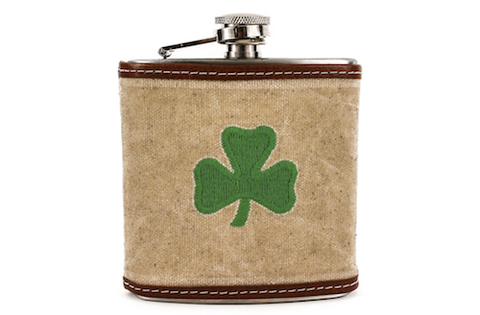 It is decorated with an embroidered green shamrock on the canvas. The flask fits perfectly into a pocket or a purse. Yes, you can be stylish and hold your vodka, gin or any other alcohol and keep it on the sly with a flask in your pocket or purse. Great to warm yourself up on cold days sitting at the soccer match. This would make a great gift for just about anyone over 21 who likes to have a nip now and then. And hey, who doesn't? Give your key ring a splash of color with one of J.T. Spencer's Key Fobs. They measure 3 inches long and are a perfect fit for pockets and purses. The fob is made of heavy brass and thick canvas and comes embroidered with a picture of an item. This one is a Labrador Retriever in black. To have your initials monogrammed is an extra $18.00. You can purchase J.T. Spencer items online at www.jtspencer.com. Like J.T. Spencer on Facebook: https://www.facebook.com/JTSpencerBelts/?ref=br_rs; Follow J.T. Spencer on Twitter: @jtspencer and Follow J.T. Spencer on Instagram: https://www.instagram.com/jtspencer_/.